This page is an open series of entries on the Bardens vs. Lanka case. 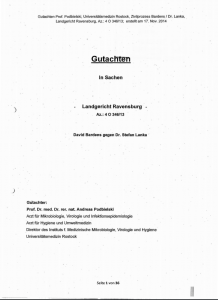 It has been of wider interest since had immediately offered the judgments in the case triggered by Stefan Lanka‘s challenge of 2011 (see documents at the bottom of this page): Lanka had offered €100.000 to anyone who could provide a single publication proving the existence of the Measles virus. David Bardens, then a student of medicine, answered this challenge in 2012 with the offer of six scientific papers on the topic and eventually sued Lanka on the prize money. The first judgment was on his behalf, the second on Lanka’s, the case is presently reviewed for further decision at Germany’s federal court, the BGH. The case has received international attention as part of the wider battle between “anti-vaxxers” and the “mainstream” of “school medicine”. We have interviewed David Bardens after the first decision in 2015 and after the second in 2016. Stefan Lanka has, thus far, not responded to our parallel interview requests of 1 June 2015 and 9 May 2016). This page gives the chronology of the case, all the documents we could obtain, and links to the most interesting press-reactions. See also Hans Tolzin’s website http://www.tolzin.de/. Oliver Kalkofe’s satirical reaction in Kalkofe’s Mattscheibe on the trial with interviews of Lanka and conspiracy theorists following the case. Stefan Lanka: That has been caused by the Asylum seekers, evidently. If you are, due to a war, separated from your family, your friends, your house, and then you find shelter somewhere and acclimatise, you are taken care of and feeling well thanks to the help of professionals and volunteers and all that… that resolves the traumata and then you see these appearances on the skin, that is exactly the reason. David Bardens at the SkepKon in Frankfurt/Main, May 14-16, 2015, his talk on YouTube. The introduction of the talk is interesting. Bardens contacted GWUP, the organisers of the German SkepKon, with a request for legal support before he answered the challenge. Bardens’s talk recapitulates the stages of the affair since 2011. The interview was partly conducted to get the information for a Wikipedia article that had been marked as too unsubstantial on the German speaking site (see here for the present German, English and French versions the article that eventually exploited our interview). Hoaxilla #183 – ‘Sieg der Vernunft’ 22. März 2015 (Podcast in German). 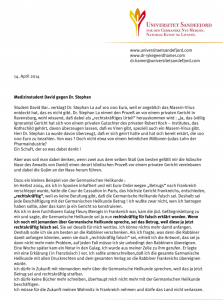 “stern TV – Mittwoch, 18.03.2015, 22:15 Uhr – live bei RTL Moderation: Steffen Hallaschka” Teil 1, Teil 2, Teil 3, uploaded by m9384hot on their YouTube channel Parts 2 and 3 have been blocked by SternTV as copyrighted content. Landgericht Ravensburg verkündet Urteil im „Masern-Fall“ Pressemitteilung des Landgerichts Ravensburg. 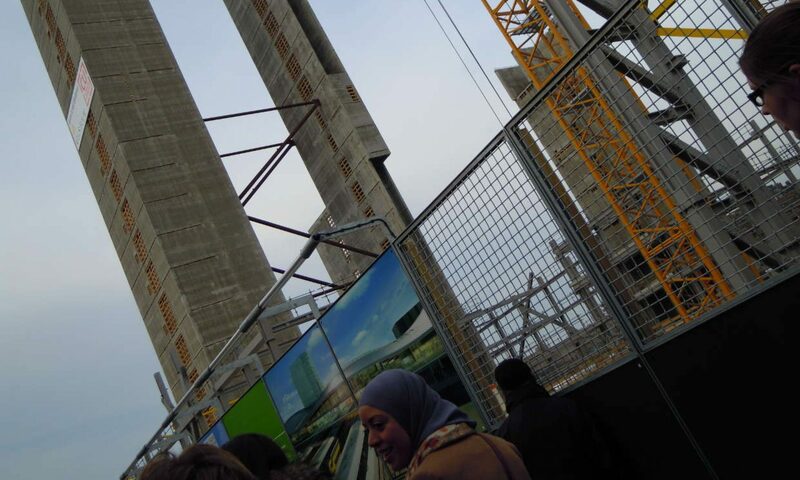 Die Urteilsschrift wurde uns vom Landgericht Ravensburg am 17. April 2015 mit der Erlaubnis zur Publikation zugesandt mit dem ausdrücklichen Vermerk, dass sie nur in der vorliegenden anonymisierten Form zugänglich gemacht werden darf. Die Namen des Richters (Matthias Schneider, 4. 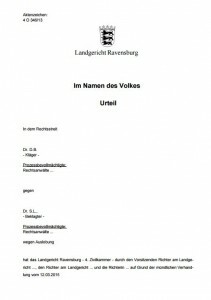 Zivilkammer des Landgerichts) und des wissenschaftliche Experten (Prof. Dr. Dr. Andreas Podbielski, Universitätsklinikum Rostock) sind offen in der Pressemitteilung des Gerichts vom 12. März 2015 genannt. 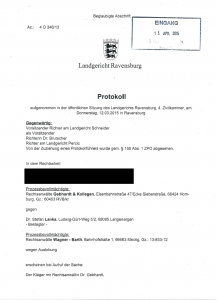 Note that we are only permitted to publish a translation that preserves the blanks of the German version we received from Ravensburg’s district court on April 17. 2015. 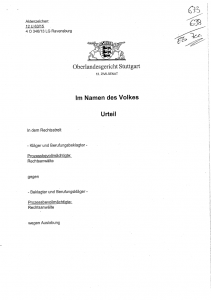 The court’s press release of March 12, 2015 states the names of the judge (Matthias Schneider) and of the medical expert (Prof. Dr. Dr. Andreas Podbielski, Universitätsklinikum Rostock). Anyone offering by means of public announcement a reward for undertaking an act, including without limitation for producing an outcome, is obliged to pay the reward to the person who has undertaken the act, even if that person did not act with a view to the promise of a reward. The court eventually postpones its judgement and declares that it will base its decision on the expertise of Andreas Podbielski, Institute of of Medical Microbiology, Virology and Hygene, Rostock. Hoaxilla #157 – ‘Masern vor Gericht’ 20. April 2014 (Podcast in German). Ryke Geerd Hamer is the proponent of his own brand of “Germanic Medicine”, “Germanische Heilkunde”. He too rejects the present assumptions of “school medicine” and assumes that we are actually witnessing the healing process wherever we diagnose the symptoms of a disease. His perspective on the Bardens versus Lanka case is remarkable with its insinuation that Lanka and Bardens are both agents of the Jewish World Conspiracy. Am Montag 14.4.2014 berichten wir an dieser Stelle, auf die wir per Newsletter hinweisen werden, dass, warum und wie der unpromovierte, fachfremde Jungarzt David Bardens und seine illegalen Hintermänner im „Wetten, dass es keine Masernviren gibt!“ – Prozess am 10.4.2014, vor dem Landgericht Ravensburg, das Gericht und die Öffentlichkeit angelogen hat. Wir rechnen damit, dass Dr. Lanka am 24.4.2014 freigesprochen wird und David Bardens wegen Gerichtsbetrug, Zahlungsunfähigkeit der Gerichts- und Anwaltsgebühren, Auslagen und Aufwandsentschädigungen, Beihilfe zu massenhafter Körperverletzung, zum Teil mit Todesfolgen und wegen Fluchtgefahr ins Ausland verhaftet wird. On Monday, April 14, 2014, we will report here, and we will also send out the note through our newsletter, that, why, and how a non-specialist young doctor, who is yet to have his PhD, David Bardens and his illegal backers, lied to the court and to the public in the “bet there are measles viruses!” trial at the District Court Ravensburg on April 10 . We expect that Dr. Lanka will be acquitted on April 24, 2014, and that David Bardens will be arrested on charges of deceiving the court, of inability to pay the court’s and attorney’s fees, costs and expenses, of complicity in causing bodily harm to masses of persons, partly occasioning fatalities, and of the risk of absconding abroad. The interview, conducted by regioTV Schwaben, is no longer available. Lanka stated his alternative theory of viruses and diseases that are said to be caused by viruses, he criticised Bardens’s handling of the case and expressed his confidence, that he will be winning the law suit. Enders JF, Peebles TC. Propagation in tissue cultures of cytopathogenic agents from patients with measles. Proc Soc Exp Biol Med. 1954 Jun;86(2):277–286. Nakai M, Imagawa DT. Electron microscopy of measles virus replication. J Virol. 1969 Feb; 3(2): 187–97. Lund GA, Tyrell, DL, Bradley RD, Scraba DG. The molecular length of measles virus RNA and the structural organization of measles nucleocapsids. J Gen Virol. 1984 Sep;65 (Pt 9):1535–42. Daikoku E, Morita C, Kohno T, Sano K. Analysis of Morphology and Infectivity of Measles Virus Particles. Bulletin of the Osaka Medical College. 2007; 53(2): 107–14. 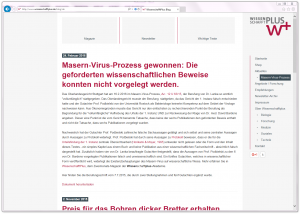 […] Ich habe Ihnen durch meine ausführliche Literaturrecherche sowohl den Beweis für die Existenz des Masernvirus erbracht, als auch die geforderten Bilder und Angaben zum Durchmesser des Masernvirus geliefert. Ich möchte mich herzlich bei Ihnen für die Möglichkeit bedanken, mit einem relativ geringen Aufwand diese recht hohe Geldsumme erstehen zu können. With the detailed compilation of literature attached I have given you both the proof of the existence of the measles virus and the required images and information on the diameter of the measles virus. I would like to thank you for the opportunity to acquire such a relatively big amount of money with such a relatively little effort. […] Ja, das Preisgeld ist ausgeschrieben. Die gesetzlichen Bestimmungen, die die Publikation erfüllen muss, sind durch das Infektionsschutzgesetz (IfSG) geregelt. […] Yes, the prize money is tendered. The legal provisions, which must be fulfilled are stated in the Infection Protection Act (IfSG). Ich habe auf Ihrer Internetseite www.klein-klein-verlag.de gelesen, dass Sie am 24. 11.2011 einen Preis von 100.000 € ausgesetzt haben für den Fall, dass man Ihnen eine Publikation zusendet, die beweist, dass es das Masernvirus gibt und die eine Aussage zur Größe der Viruspartikel trifft. Auf der Internetseite heißt es: „Das Preisgeld wird ausgezahlt, wenn eine wissenschaftliche Publikation vorgelegt wird, in der die Existenz des Masern-Virus nicht nur behauptet, sondern auch bewiesen und darin u.a. dessen Durchmesser bestimmt ist. Ich würde Sie gerne bitten mir kurz schriftlich zu bestätigen, dass der Preis in dieser Form und zu diesen Bedingungen immer noch ausgeschrieben ist. 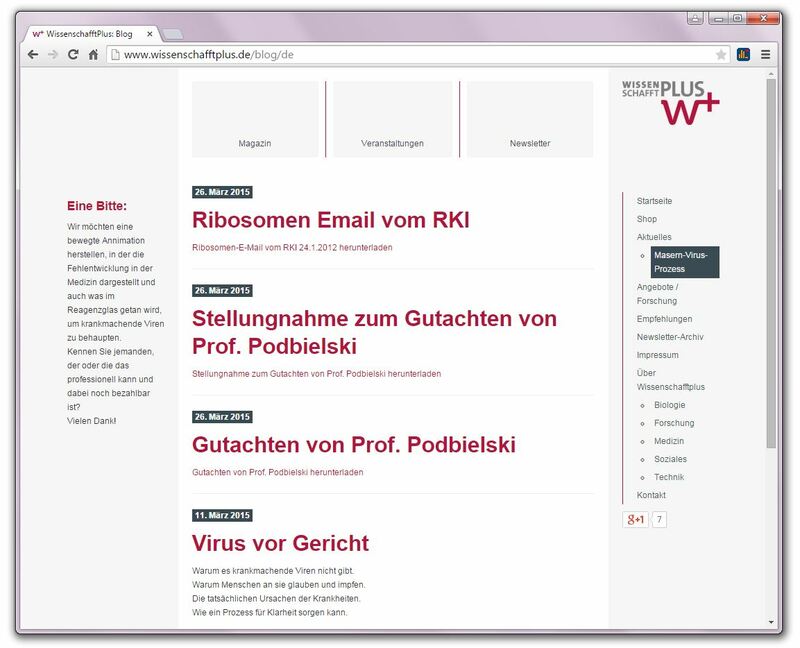 I read on your website www.klein-klein-verlag.de that you have offered a prize of € 100,000 on 24 November 2011 in the event that one sends you a publication that proves the existence of the measles virus and that gives a statement on the size of the viral particles. The announcement on your website reads: “The reward will be paid, if a scientific publication is presented, in which the existence of the measles virus is not only asserted, but also proven and in which, among other things, the diameter of measles virus is determined. I would like to ask you to confirm briefly in writing that the price is still advertised in this form and on such terms. The original call to prove the existence of the measles virus is no longer online. Archive.org’s WaybackMachine still offers a copy. The original design deserves the screenshot because it was not too clear what exactly one was reading here: a serious challenge, a polemical provocation, both? 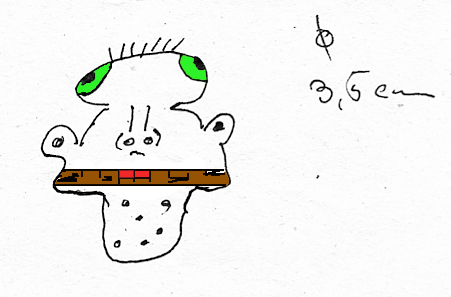 The challenge included a humorous illustration of the presumably fictitious virus. Stefan Lanka, “Das Masern-Virus 100.000 € Belohnung! WANTED Der Durchmesser”, original link at http://www.klein-klein-verlag.de has expired. The copy retrieved by archive.org on 2012-03-29. A pdf-print-version based on the copy of archive.org’s WaybackMachine. Der Hintergrund der jetzigen Werbewelle für die Idee, dass Masern durch ein Virus verursacht werde und deswegen Impfstoff implantiert werden solle, ist das Faktum, dass im September die Ausgaben für Impfstoffe um 19% im Vergleich zum Vorjahresmonat zurückgegangen sind. Da im ausgabenstärksten Teilmarkt, den Grippe-Vakzinen, der Rückgang sogar 29% beträgt, weil hier die Schweinegrippe noch negativ auf den Umsatz drückt, hat sich die Bundesregierung entschlossen, kräftig die Werbetrommel für die Masern zu rühren. Zuerst überflutete sie die Bevölkerung mit hundertausenden Broschüren „Impfschutz für die ganze Familie“, in der an erster Stelle für die Masern-Impfung geworben wird, mit dem Argument, dass das Virus tödlich sei und das Gehirn auflöse. Gleich nach der Verteilung der Broschüre startete die WHO mit der Masern-Werbung und der Behauptung von 26.000 bestätigen Fällen seit 01.01.2011 in 53 Ländern, von denen 14.000 auf Frankreich entfallen würden. Damit wurde Angst vor einer unmittelbar aus Frankreich hereinbrechenden Pandemie geschürt. Am 09.11. wurde behauptet, dass jährlich 164.000 Menschen an Masern sterben und sich 55 Millionen infizieren. Mitte November wurde behauptet, dass sich in Berlin die Masern-Fälle verdoppelt hätten und schwere Verläufe einträten. Dann schlug der Berliner Gesundheitssenat Masern-Alarm: „Die aktuelle Situation erfordert vor allem bei aufgeklärten Menschen die Überprüfung ihrer bisherigen Skepsis gegenüber Impfungen“, so die amtierende Gesundheitssenatorin Katrin Lompscher (Die Linke). Wenn also deutsche Forscher im Auftrag der Bundesregierung mit Masern-Viren arbeiten, muss es eine Dokumentation dieser Forschungen geben, zumal aus diesen Viren Impfstoff gemacht und diese Partikel in der Krebsforschung eingesetzt werden sollen. Dabei leuchtet ein, dass als erstes wissenschaftliches Kriterium der Durchmesser dieser Viren bekannt sein muss. die Aufgeklärten im Sinne der Gesetze auf die Akteure einwirken. Es ist nämlich verboten Unwahres zu behaupten, damit die Würde der Menschen zu verletzen und auf dieser Basis durch Impfungen der körperlichen Unversehrtheit und dem Recht auf Leben zu schaden. In Deutschland hat die Bundesregierung Frau Dr. Mankertz beauftragt, im Rahmen des Gesetzes, also des Grundgesetzes und des Infektionsschutzgesetzes (IfSG), eigenständig Forschung zu den Ursachen von Masern zu betreiben. Da sie selbst die Zucht von Masern-Viren behauptet, muss ihr der Durchmesser des Masern-Virus bekannt sein. Zumindest muss sie wissen, wo es steht. The background of the current wave of advertisments promoting the idea that measles is caused by virus and therefore vaccine should be implanted, is the fact that in September this year, the spending on vaccines has gone down by 19% in comparison with the corresponding month last year. Since the strongest budget spending submarket, the flu vaccines, has declined as much as by 29%, because the swine flu still registers negative turnout here, the Federal Government has decided to conduct vigorously noisy warning campaigns against measles. First, they flooded the population with hundreds of thousands of leaflets, “vaccinations for all the family members”. Their top priority as to advertise the measles vaccination, arguing that the virus is deadly and dissolves the brain. Immediately after the distribution of the leaflets, the WHO began advertising measles vaccination and asserted that there had been 26,000 confirmed cases since 1 January 2011 in 53 countries, of which 14,000 cases were accounted for in France. This fueled the fear of an immediate invasion of the pandemic from France. On 9 November, it was claimed that 164,000 people die from measles and 55 million become infected every year. In mid-November they claimed that measles cases had doubled in Berlin and that they entailed severe consequences. Then the Berlin Health Senate issued a Measles Alert: “The current situation requires especially informed people to reconsider their previous skepticism about vaccinations”, said the current Health Senator, Katrin Lompscher (The Left). So, if German researchers work on measles viruses on behalf of the Federal Government, such research must be documented, especially since vaccines are made from these viruses and these particles to be used in cancer research. It is self evident that no such research can be scientifically conducted without at least knowing the diameter of these viruses. those who are informed to influence the relevant actors as designed by the laws. It is in fact forbidden to make false claims that violate human dignity – only to get a basis on which one can infringe the physical integrity and the right to life with vaccinations. In Germany, the Federal Government has appointed Frau Dr Mankertz to conduct independent research into the causes of measles under the law, that is under Germany’s Basic Law and the Infection Protection Act (IfSG). Since she herself asserts that she is breeding measles viruses, she must necessary know the diameter of the measles virus. She must at least know where to look it up. The reward will be paid, if a scientific publication is presented, in which the existence of the measles virus is not only asserted, but also proven and in which, among other things, the diameter of measles virus is determined. Auch wenn diese Zeichnung von einem lieben Leser von uns stammt und natürlich als Spaß als Reaktion auf unseren letzten Newsletter zu verstehen ist, so muss man doch sagen, dass im Kern die offizielle Wissenschaft, auf die sich alle berufen, nicht viel wissenschaftlicher arbeitet. Nur ihre Zeichnungen und Modelle sehen für den Laien etwas wissenschaftlicher aus, das ist oft schon der ganze Unterschied. Wenn sich herausstellt, dass Frau Dr. Mankertz Masern-Viren behauptet, ohne einen wissenschaftlichen Beweis für deren Existenz zu haben, darf ihr Verhalten – so zu tun als ob es ein Masern-Virus gäbe – nicht hingenommen werden. Sollte sich herausstellen, dass Prof. Mielke weiß, dass Frau Dr. Mankertz ohne wissenschaftliche und damit gesetzliche Grundlage arbeitet, muss sich dann bei der Leitung des RKI, beim Präsidenten des RKI, Prof. Dr. Reinhard Burger beschwert werden. Sollte sich herausstellen, dass Prof. Burger weiß, dass Frau Dr. Mankertz ohne wissenschaftliche und damit gesetzliche Grundlage arbeitet und weiß, dass auch Prof. Mielke in Bezug auf das Masern-Viurs ohne wissenschaftliche und damit gesetzliche Grundlage arbeitet, muss sich dann bei der zuständigen Person im Bundesgesundheitsministerium über Prof. Burger beschwert werden. Bitte senden Sie mir Ihre Anfragen und Antworten zu, die wir veröffentlichen dürfen, damit sie wirksam werden. Wer wissen möchte, wie Masern im Detail entstehen, verhindert und therapiert werden, dem sei unser Buch zum Thema Masern empfohlen. an dem wir mitgewirkt haben. Ist HIV eine Todesdiagnose? Muss man krank werden, weil die Experten sagen, dass man krank werden und in so und so vielen Jahren sterben wird? Es gibt Menschen, die trotz dieser Diagnose nicht krank werden, teilweise seit Jahrzehnten nicht. Was ist das Geheimnis ihrer Gesundheit? Warum erfahren wir nichts von ihnen? Wir sollten meinen, dass diese Menschen im Zentrum des medizinischen Interesses stehen und gründlich erforscht werden. Aber das Gegenteil ist der Fall: sie werden ignoriert, bekämpft, bedroht und kriminalisiert. Warum? Bitte vorher per email an info@bluebell.de anmelden, mit wie viel Personen Sie kommen wollen. Copyright © 2009 klein klein verlag Alle Rechte vorbehalten. This drawing comes from a dear reader of ours, and is of course only to be understood as fun, as a response to our latest newsletter. However, it must be said that in essence the official science, to which all refer as an authority, does not do a more scientific job than that. Only its drawings and models look a little more scientific in the eyes of laymen. This is often all the difference. If it turns out that Dr. Mankertz speaks of measles viruses without any scientific proof of their existence, then her conduct – to act as if there were a measles virus – must not be tolerated. If it turns out that Professor Mielke knows that Dr. Mankertz is working without any scientific and in that case without any legal basis, complaint must be made to the management of the Robert Koch Institute, the President, Professor Dr. Reinhard Burger. If it turns out that Professor Burger knows that Dr. Mankertz is working without any scientific and in this case without any legal basis, and if he also knows that Professor Mielke is working in – when it comes to the measles virus – without any scientific and legal basis, complaint must be made to the appropriate person at the Federal Ministry of Health who has authority over Professor Burger. Please contact me with inquiries and with answers which we may publish so that they can get effective. Anyone who wants to know in detail how measles come about, how it is prevented and treated, here is our recommended book on measles. In this sense, all the best! We have participated in it. Is HIV a death diagnosis? Do you have to become ill because the experts tell you that you are ill and will die in so and so many years time? There are people who do not become ill despite such a diagnosis, some not in decades. What is the secret of their health? Why don’t we learn something from them? We should think that these people stand in the centre of medical interest and research. However, the opposite is the case: they are ignored, they are fought against, threatened and criminalised. Why? Please register in advance by email at info@bluebell.de and tell us the number of people you would like to come along with. Copyright © 2009 small small publisher All Rights Reserved. Pingback: Viruses. How Much Is That Dogma In The Window?